With increasingly ambitious silk design, came a drive to improve weaving technologies. The breakthrough design, the Jacquard loom, is a phenomenon of the early years of the 19th century but - to the excitement of computer historians - Jacquard's basic principle of encoding patterns on machined paper - was anticipated by 18th century pioneers. From the early 17th century onwards, Lyons characteristically complex silk brocades, known as "figured" fabrics, were made using a type of loom called a "drawn loom" (métier à la tire) . In plain weaving, warp threads were pulled into groups linked to vertical coupling cords (lisses) fixed into frames (lames) which were operated by pedals. Patterns could be sophisticated but were always symmetrical and repetitive. With the métiers à la tire, on the other hand, the warp threads were selected individually and, rather than being gathered into frames, were pulled by hand with attached cords. To do this, the cords were arranged into small groups linked by lashes or "loops" (lacs) and tied to a thick cord in the order they had to be pulled. Each loop corresponded to one colour of the weft. The weft in turn was composed of threads (duites) of different shades reeled on small shuttles. To set up a simple from a design template was a skilled and laborious process; each simple had up to eight hundred hanging cords and took twenty-five days to complete. When the master weaver had finished weaving one design he would have to move to another loom whilst the new simple was loaded on the first. TThe 18th century saw number of technical improvements aimed at lowering the cost of simples, reducing number of auxillary workers and facilitating more complex patterns. 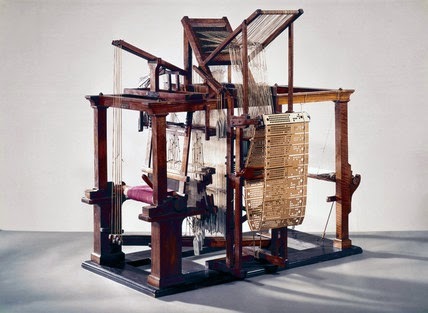 Liliane Pérez, historian of these inventions, has emphasised the positive role of the Lyon guild organisation, the Grande fabrique, with its wealthy merchant members, in encouraging and supporting innovation in both loom technology and fabric design. The key innovation took place in 1725 when Basile Bouchon, son of an organ-maker and weaver (odd combination that) adapted a mechanism based on the cylinders of musical automata to control the métier à la tire using perforated paper tape. The hanging cords which controlled the warp threads had horizontal needles attached to them which struck against the paper. 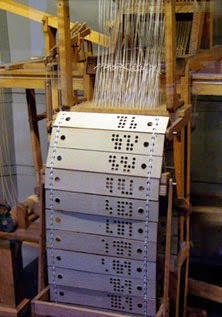 When the needle hit the paper (as opposed to a hole) it was pushed back and grasped by a fork, connected to a pedal operated by a draw girl, which would then pull the warp thread down. 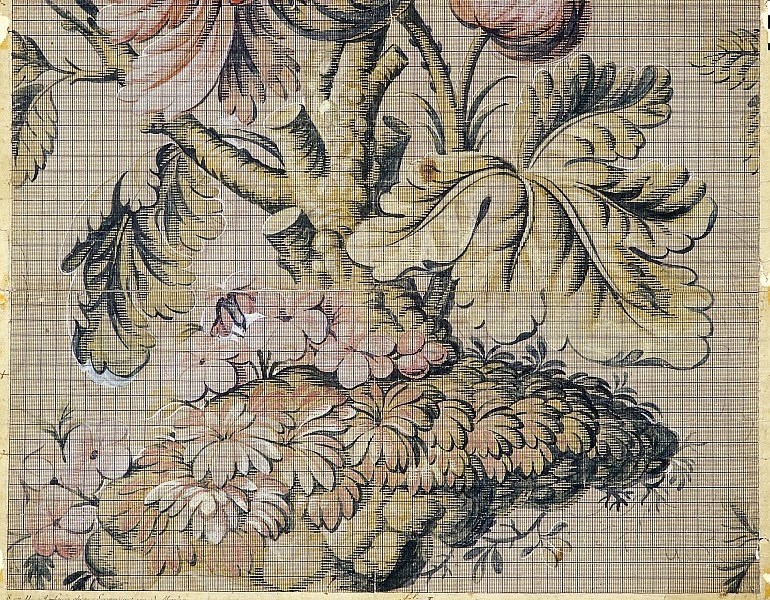 Bouchon's partner, Jean-Philippe Falcon, refined the device in 1728 by replacing the roll with a chain of perforated cards hanging from a prism, which allowed greater numbers of needles and more complex patterns. His so-called "reading-machine", using cutting stamps tied to hanging cords, allowed for mass production as patterns could be copied many times. In 1744 the Royal Inspector of Silk Manufactures and famous automaton designer Jacques de Vaucausson made a further refinement by connecting his mechanism to a pedal operated by the weaver himself, so eliminating the need for a second worker . 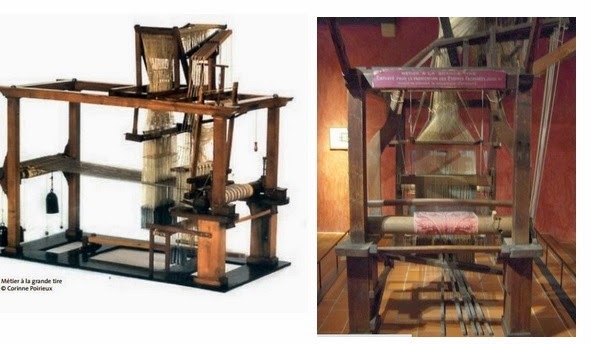 The inventions of Bouchon and Falcon were modestly successful: about 40 such looms had been sold by 1762. Liliane Pérez uses the example of the Lyon silk weavers to show how the interplay of central and local government with traditional guild structures could be constructive in the promotion of innovation. Of the 170 Lyonnais inventions addressed to the Bureau de commerce in Paris between 1700 and 1789, a high proportion related to weaving, submitted by the artisans themselves, mostly by independent masters. From 1725 innovation was rewarded by a fund created from a tax on foreign silk. After 1752 this was controlled by the intendant, but its procedure of inquiry involved both corporative, municipal and academic institutions. The rewarded inventions were deposited in the Fabrique’s office, close to the guild’s chapel (église des Jacobins). From there inventors could teach their technics to others and the deposited inventions could be integrated to the traditional procedure for the creation of masterpieces. In 1744, under the impetus of the new Royal Inspector Jacques Vaucanson, the Fabrique’decided to promote Falcon’s looms; they were made compulsory in the production of masterpieces, and masters were allowed an additional fifth loom provided it was “un Falcon”. Wow! Thanks so much for this great article about figured silk! It's a great piece for writers to read. Please keep the great posts coming. Chaulieu, Voltaire and "the Temple"
18th-century Lyon - virtual reality! Denis Monnet - working-class hero?